Let’s discuss the influents and the effluents. That’s right, you high school graduates–the poop flows in­–that’s the influent. What empties 5 miles out into the Santa Monica Bay, what is ground up, dehydrated and sifted for fertilizer, and what you personally contribute if you live in Los Angeles, is the effluent. And it’s all managed through chemistry and engineering at the Hyperion Treatment Plant. 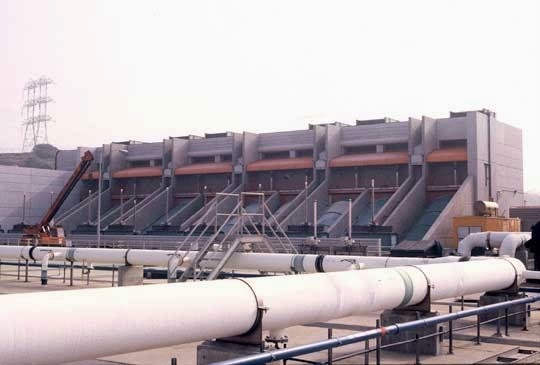 Headworks – where the big stuff is captured: I don't have a picture of this, but I like saying it. Solids removed during primary and secondary treatment are pumped to these huge, egg shaped vessels. Good to know: The biosolids that are processed here are considered Exceptional Quality.